Educational Series Movies - "Angst" & "Like - The Movie"
Last year, Screenagers! This year, we are screening the Award Winning movies Angst and Like! These two documentaries highlight the increased anxiety and pressures facing our youth as they navigate a new culture and social climate of additional personal exposure, and rapid pace within an ever changing world. Join the Glenwood Springs Schools Prevention Team for our 21st Century Student Information and Inspiration Series where we will screen the award winning movie ANGST! The movie will be followed by a panel of experts who will share new research in the areas of anxiety, the adolescent brain, and local resources and skills we can use to reset, regulate and reclaim peace and calm within our daily lives. Join the Glenwood Springs Schools Prevention Team for our 21st Century Student Information and Inspiration Series where we will screen the award winning documentary The LIKE Movie! The documentary will be followed by a panel of experts who will share new information about the influence of social media in our lives, local issues and concerns we have regarding laws and the impact of media, and ways we can build regulation. The evening will also include summer programming options and support to build a calendar of inspirational actives for our students and families! THE GLENWOOD SPRINGS ARTS COUNCIL is hosting this first-time event at the popular Vaudeville Theatre in Glenwood Springs. Featured will be a video presentation of performances from previous years of the International Jazz Day and three live acts- the high school jazz bands from Coal Ridge and Roaring Fork schools plus Kathy Morrow, a jazz vocalist from Vail along with her band. 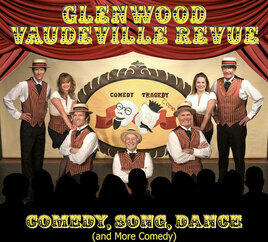 Full Vaudeville menu and bar are available, and we will have a dance floor for those so inspired! We are joined in this event by Jazz Aspen. Contact board@glenwoodarts.org or call 970-355-9689 to reserve your table. With well over 200 high profile shows already throughout the U.S. in 2016-18, BOS have become known as the top touring Eagles Tribute band in America. The Eagles themselves sold over 120 million albums worldwide, and their music brings instant fond memories to the millions who bought their records and attended their concerts. It has been said repeatedly by fans of The Boys Of Summer after watching them, "Close your eyes, and you're there". Select party size then desired date of show and time & click "next". Then be sure to check the small box to the left of desired show name to proceed.